...mission accomplished, I'd say. 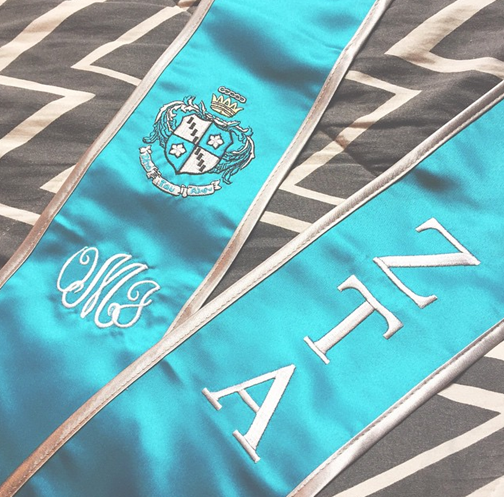 It was definitely designed to appeal to Zetas above anything else, because that's pretty much what I cared about most in college - above anything else. 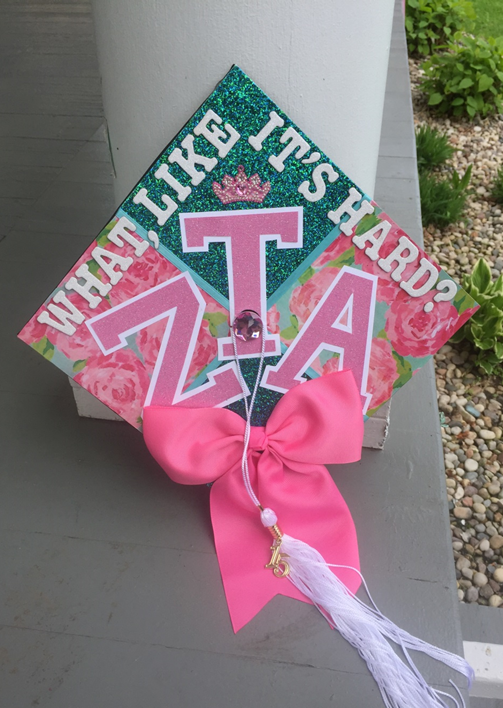 I knew I had to incorporate our letters, the crown, the best Lilly Pulitzer pattern known to man (First Impressions), and also some kind of nod to Elle Woods (my role model circa 2001). If you're unfamiliar, in Legally Blonde she shows up at Harvard, Warner questions her intentions and how she got into Harvard, and she says, "What, like it's hard?" The whole cap kind of just came together before my eyes. 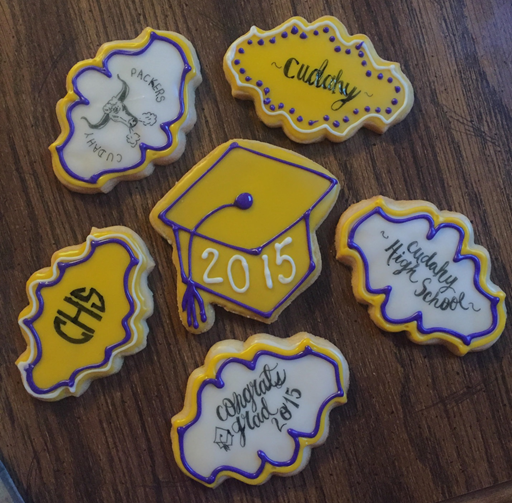 It inspired me to offer graduation cap decorating as a service on my future Etsy shop. Oh, the possibilities. 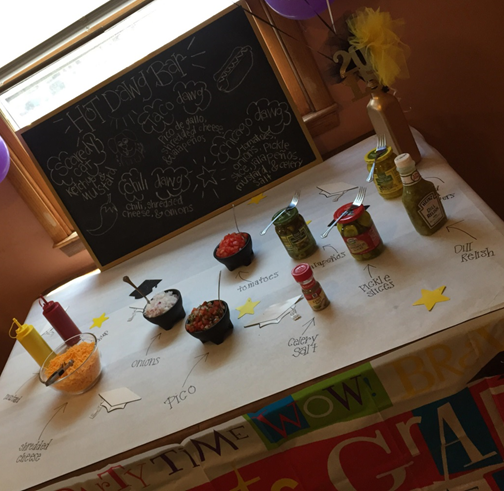 Moving on, while preparing for my grad party, I scrolled past a post on Instagram from this party shop I follow called Bracket. 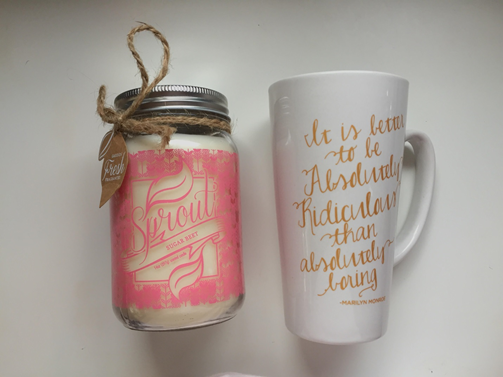 They make custom holiday/bachelorette/etc. headbands and they were advertising one that said, "Welcome to the real world." I had to have it. 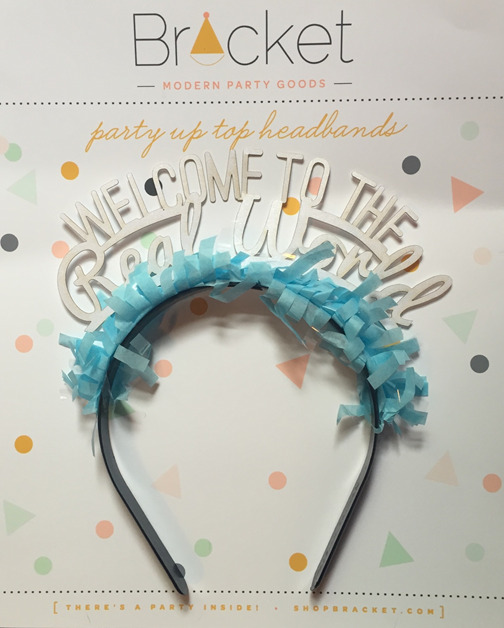 It also took a lot of self-control to not post a picture of this headband before the actual party. I can't remember how much it actually was, but I'm pretty sure it came up to about $6-8 with shipping and everything! 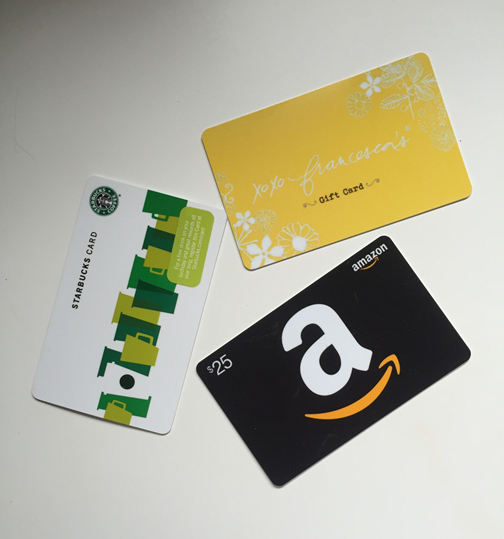 You can get a discount for your first order if you sign up with your email. Score. It's awesome, they can create a custom headband with anything you want it to say! 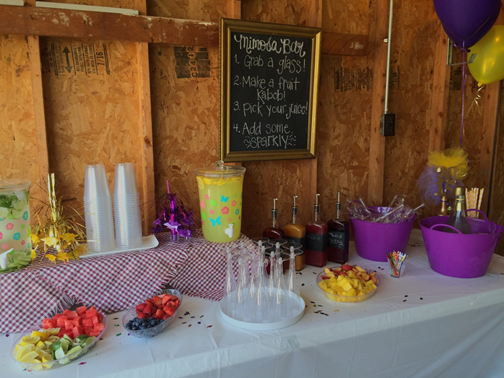 They also do drink stirrers and a couple different types of party supplies, but they're known for creating "a party up top." If I had been a little more prepared, I would have ordered a 4th of July one as well. I also got a lot of use out of this shirt I bought from Victoria's Secret my senior year of high school. 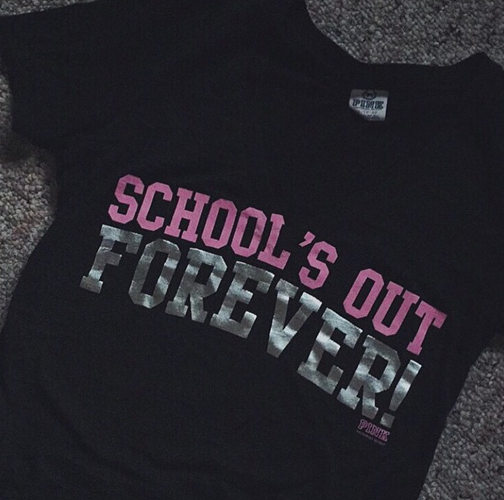 Back then I bought it and was wearing it because technically my years of required school were over... I also knew it would be a good shirt to wear my senior year of college, and boy was I right. As you can see, I'm a planner. I planned an outfit four years in advance. I got a lot of use out of this little number during my last week of school. So relevant. 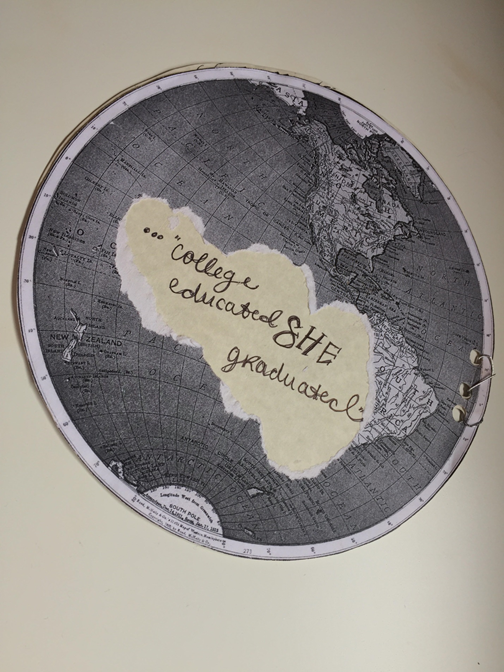 Finally, I think I should give a shout-out to my friends and fam who came up with the best and most creative gifts for my graduation! 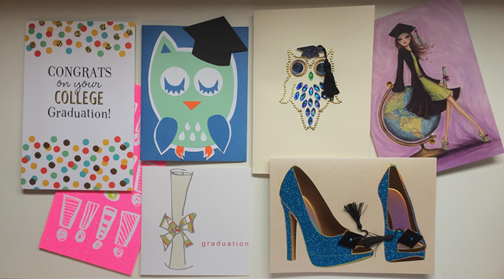 Who knew they even made this many cute grad cards? There were so many good ones that I couldn't fit them all in one photo. Target these days, I tell ya. 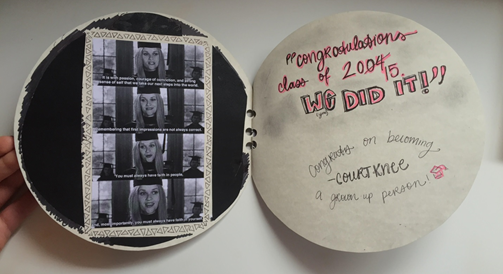 And then this one from Courtney, in which the theme was Legally Blonde AND traveling! If you understand the inside portion, we're probably soulmates. Also, this card was paired with wine. Then my aunt made me this topiary of dollar bills. 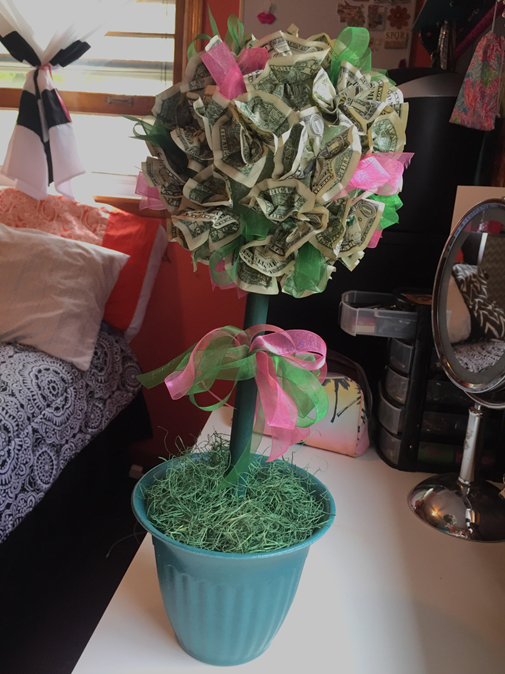 Literally, a money tree. This is one of the only times where when I say the word literally, I actually mean it literally. Coffee drinking, shopping, crafting, reading, and walking around with expensive handbags. 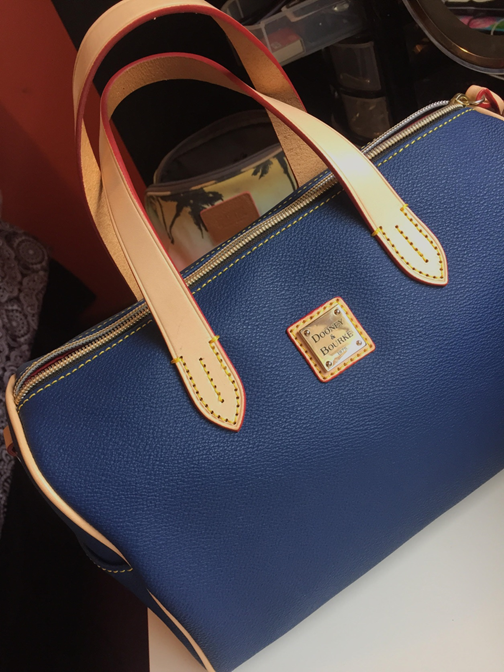 It's a bag that's named after me. 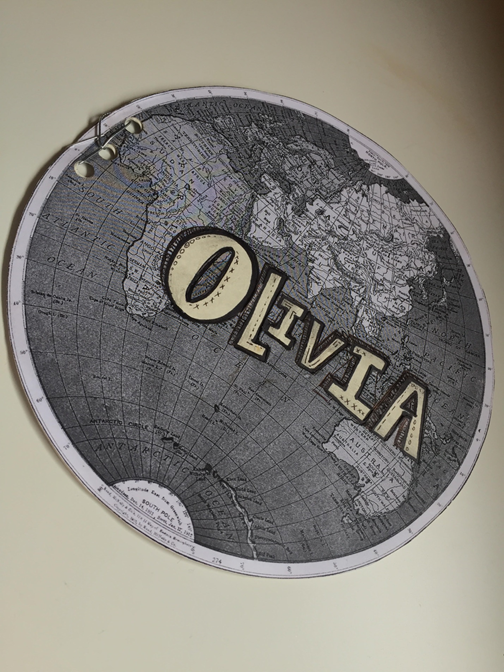 The Olivia. Some things are just born to go together. My old roommate remembered my two main obsessions through our two years together: Coffee mugs and candles. Both of which I conveniently cannot get enough of. 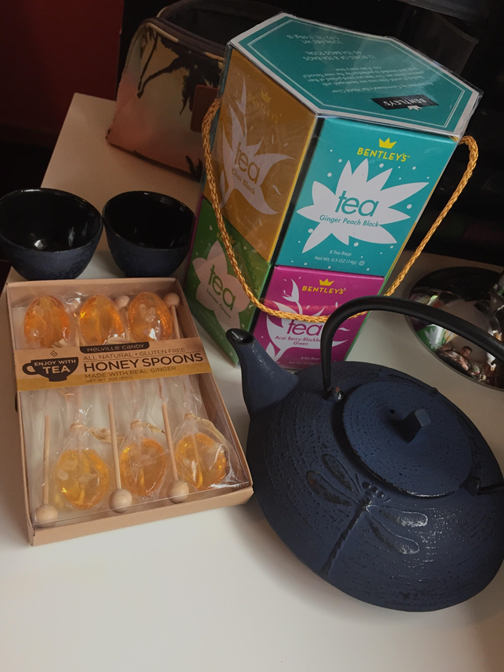 Then my uncle threw in this CURVEBALL and bought what essentially is the tea set of my dreams. I've decided when I have a real home of my own, I'm collecting teapots (vintage or not) and arranging them in some sort of elegant fashion for visitors and tea drinkers alike to gaze at in amazement. That would be awesome. 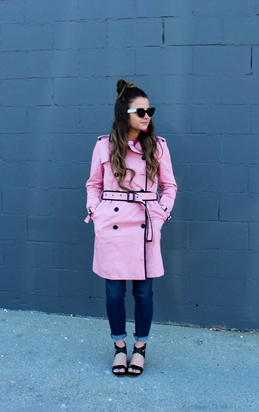 Last but not least, my friend from high school took the liberty of creeping through my Pinterest boards to find things I currently love. Yes, flamingos and pineapples. I can't explain the attraction, but it definitely exists deep down in my soul somewhere. Overall I determined that yes, these people really know me. I'm glad everyone I know enjoys finding extremely person-specific gifts as much as I do! 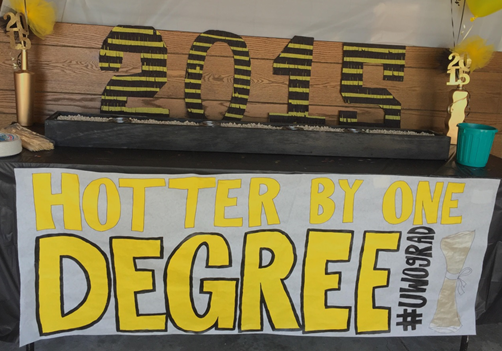 After all, I'll really miss the festivities surrounding my graduation. I know when everyone goes back to school in the fall it's going to be weird for me. But with a new real person job and enough activities and dining establishments in this city to occupy me, I think I'll be just fine! 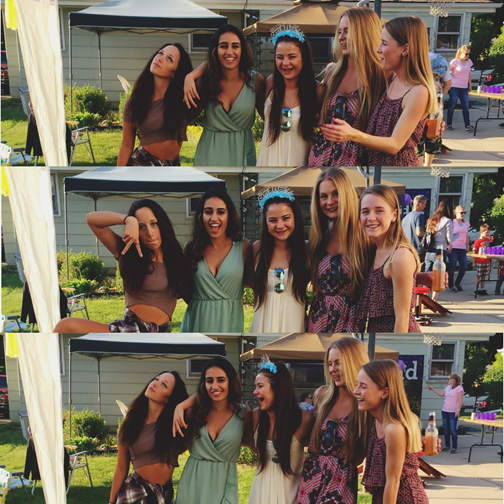 "It'll be the cutest little backyard wedding graduation party since I don't know when!" ...as I tried to get people pumped up. It worked. I followed through on all my original ideas except the Bloody Mary bar, and will be saving that one for a brunch party or something. 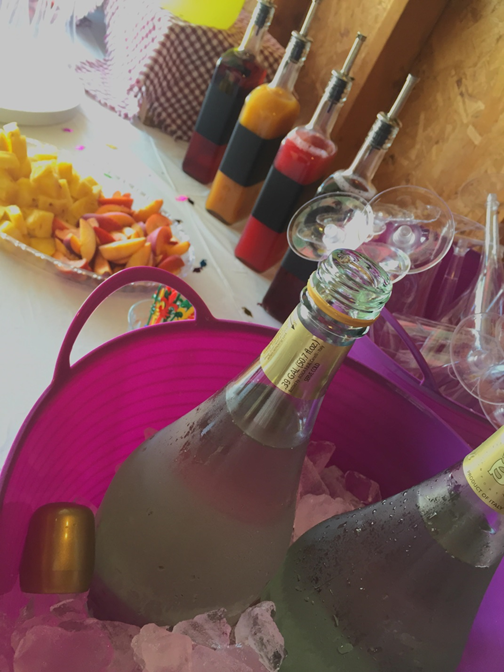 Other than that, we had a mimosa bar, s'mores bar, and hot dog bar, all which went over veeeeeery well. 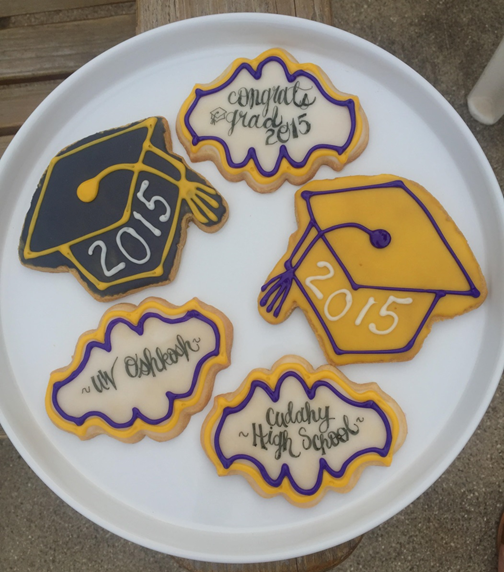 This was a combined grad party with my cousin who had just graduated from high school. He probably would have been satisfied with no party at all, but we weren't letting that idea fly. 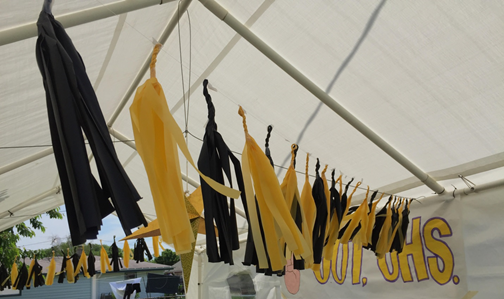 Luckily my school's colors were black and gold and his were purple and gold. 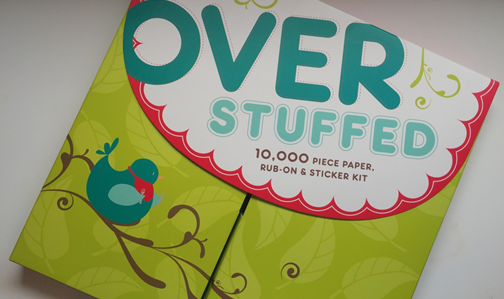 Overlap, yay! 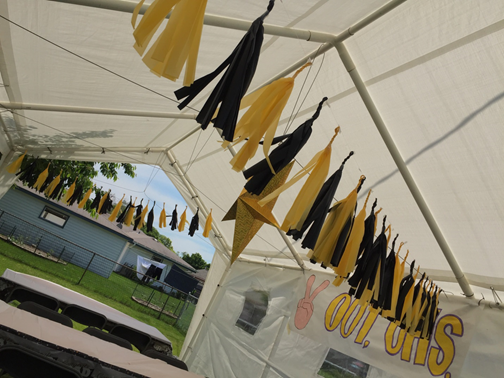 My aunt, my mom, and I made all the decorations to match those colors and threw what was literally the cutest little backyard graduation party since I don't know when. And I've been to a lot of backyard graduation parties. Let's start with the cookies. 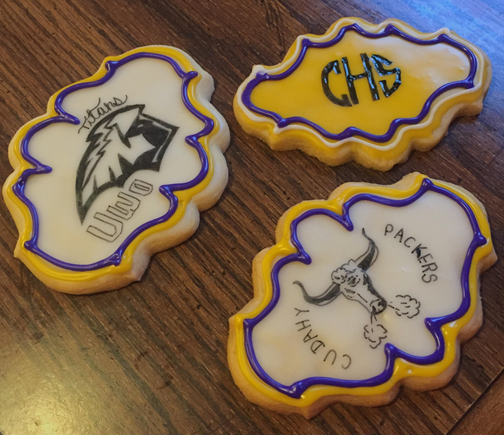 These edible works of art were created by my cousin Maya, my aunt, and I. Luckily Maya likes baking them (which I hate) and my aunt and I like decorating them (which she hates). It works out to everyone's benefit. I did all the writing with these Wilton candy writing pens. I credit my talent in this to having a REALLY steady hand and being able to kind of paint it on instead of write like you would with a pen. The frosting is just so delicate that it's a challenge to not push too hard. Any other decorations we piped on with frosting. 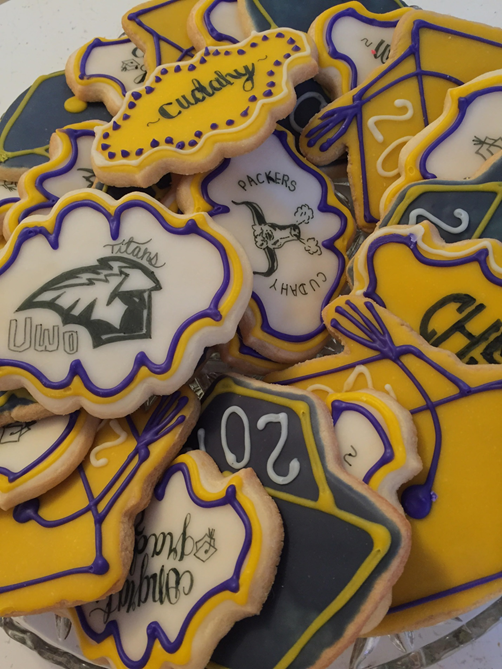 We already have an order for a friend's graduation party next week! 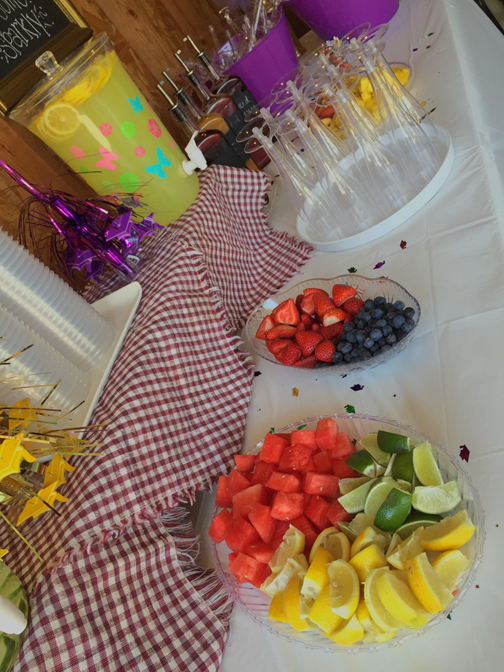 Next, what I think was the biggest hit, the mimosa bar. 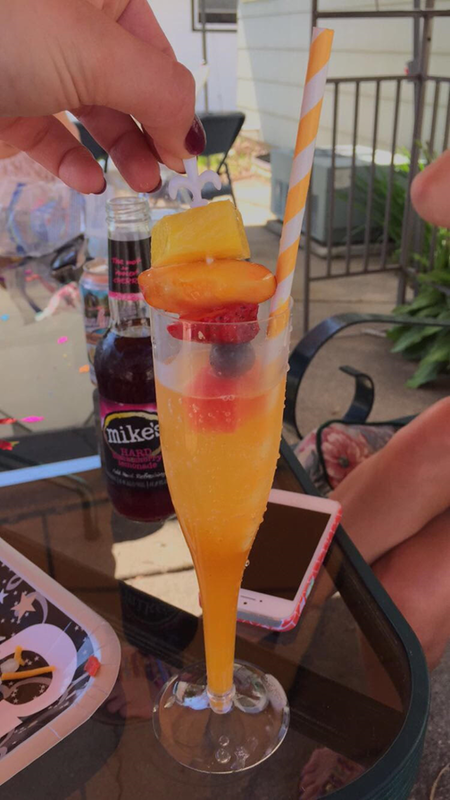 As seen many different times on Pinterest, we just combined all our favorite aspects of different mimosa bars to create the one of our dreams! 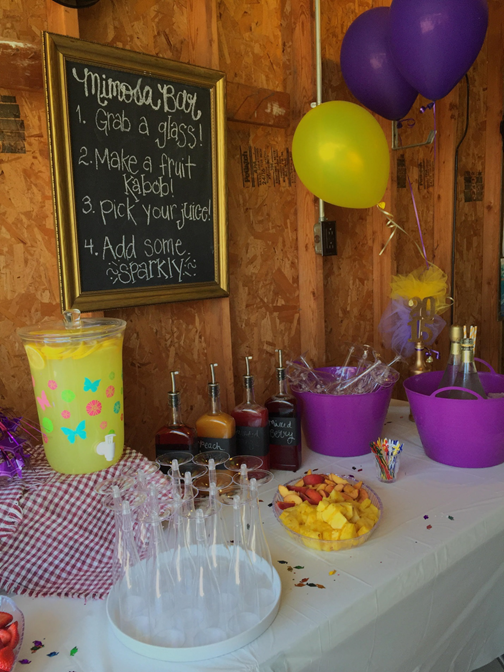 I mean, for a mimosa bar in a garage, I don't think we could have done any better! It was a hit. 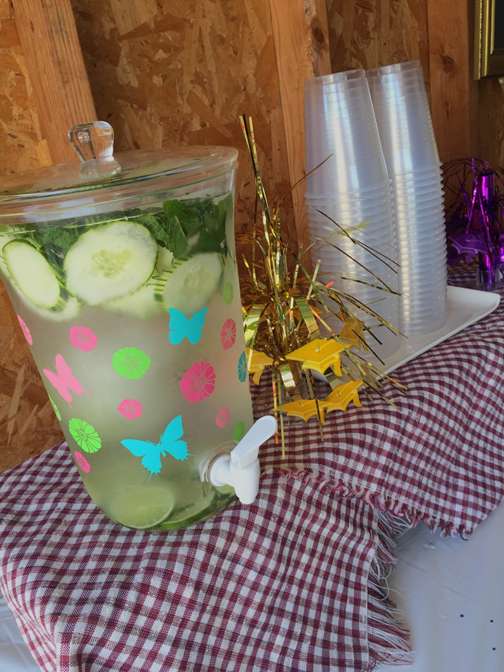 For those who drink festive non-alcoholic drinks, we had cucumber and mint infused water and lemonade. The smartest thing ever was my aunt's idea to freeze blocks of cucumber water and lemonade so that nothing got watered down. Sheer brilliance. The chalkboard you see here was once a portrait of Jesus. Really. Last summer I was looking for an interesting frame at Value Village to make a chalkboard for a 4th of July burger bar, and found that gem. It felt like a possible cardinal sin painting over the face of Jesus with primer and chalkboard paint, but it turned into an awesome chalkboard that now hangs into my living room. 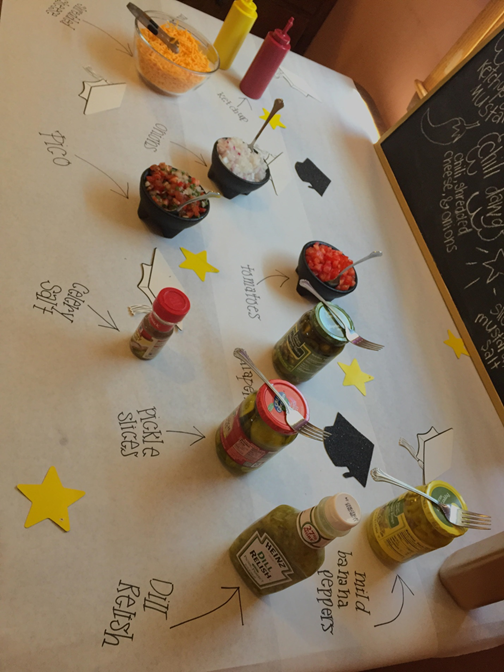 We used blue painter's tape make rings of chalkboard paint around the fruit juice bottles. I then wrote the names of each of the different nectars (a little thicker than juice, actually). We had mixed berry, blood orange, peach apricot, and pomegranate. 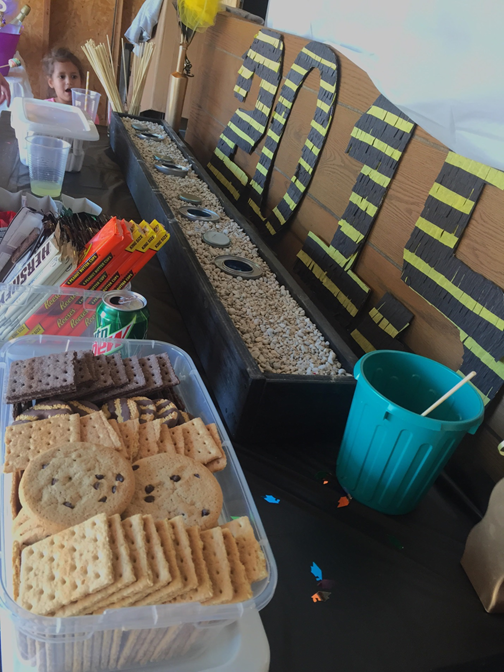 Next, was a hit with kids and adults alike. Square shaped marshmallows. Who thinks of these perfect ideas?! I wish I had a picture of all the different marshmallows we had. From square, to chocolate filled, to rainbow, to coconut, to strawberry, we had them all. Same goes for every type of chocolate and every type of graham cracker (or cookie if you prefer). 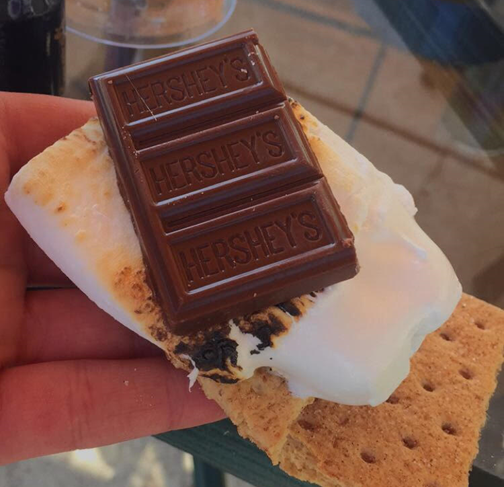 Grab a skewer, stick a marshmallow on, roast it over the ETHANOL BASED Sterno for a bit, throw the stick in the can on the opposite side, and put together your dream s'more. 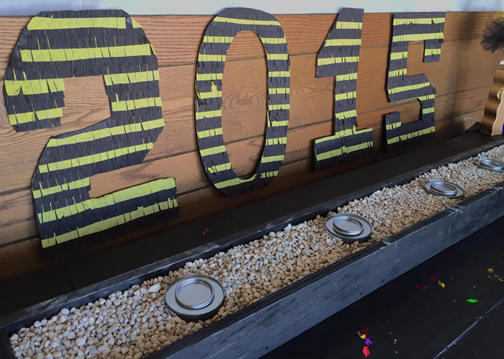 The 2015 pinata numbers were an idea from a Martha Stewart magazine. Thanks, Martha! The main course at this party was the hot dog bar, where we had the toppings for four different dawgs: Scaredy cat (ketchup & mustard...lame), Chili dawg (chili, shredded cheese, & onions), Taco dawg (pico de gallo, shredded cheese, & jalapenos), and Chicago dawg (tomatoes, onions, pickle slice, peppers, mustard, & celery salt). 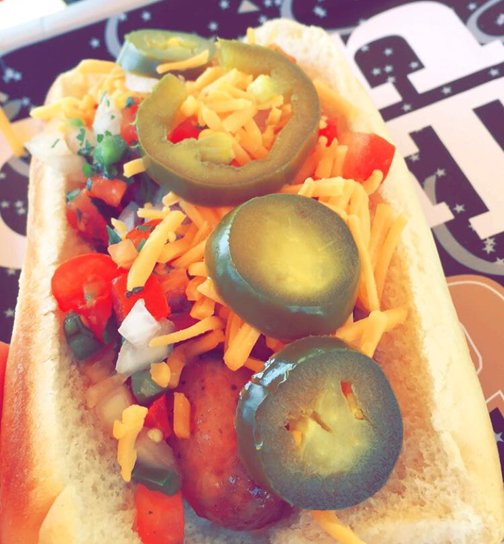 Above is my version of a Chicago dawg, with a brat. I do what I want. 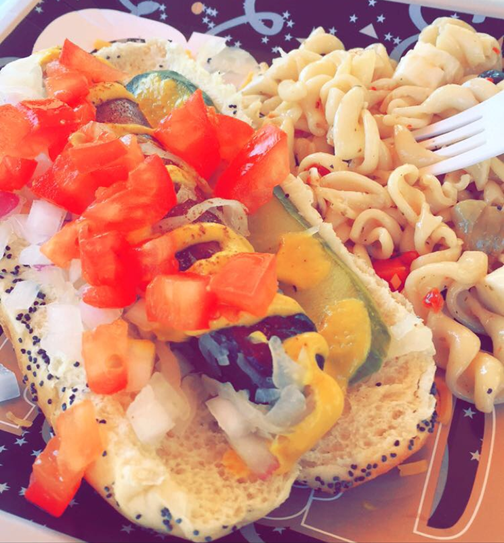 This would be the so-called Taco dawg. The reality of having all the hot dogs and brats that you could possibly imagine right in front of you is amazing, to say the least. That brings us to the decor. 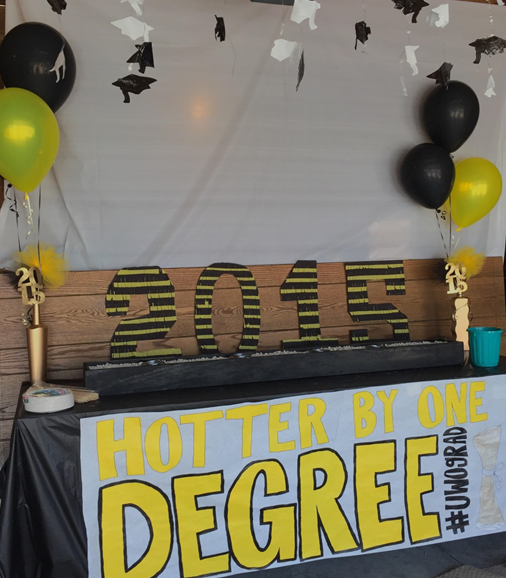 I will never make tassel garland for an outdoor event EVER again. It was such a struggle keeping them from all being blown to one side of the fishing line. Once I got it how I wanted it, it looked good. But it took me like an hour to figure out how to arrange it. This was the first time I cut them out of tablecloths though, which was such an improvement from tissue paper! If I can find the right colors, I'll definitely be doing it with tablecloths in the future. This was another idea straight off of Pinterest. Luckily my aunt had a bunch of glass bottles in her craft junk arsenal, so my dad spray painted them all gold. They'll definitely be reused for future parties. 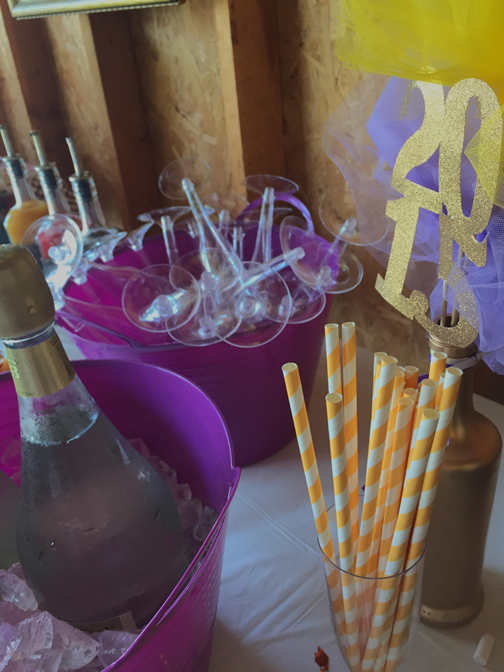 My cousin Maya and I cut out all the 2015s out of glitter paper and made tulle puffs to match the school colors. 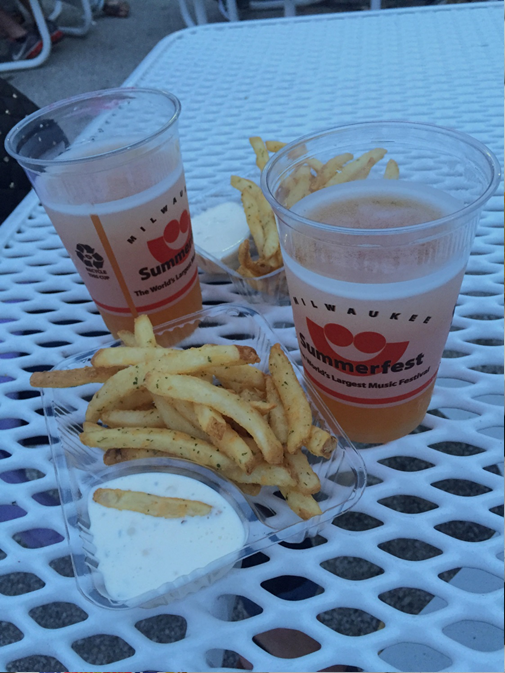 Summerfest: I'll try everything first, so you don't have to! With 19 free tickets this year, I had to make my rounds to the WORLD'S LARGEST MUSIC FESTIVAL which is a fifteen minute ride from where I live. Usually I show up at least a few times every summer, and usually I get the exact same food. 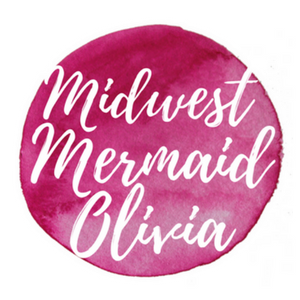 This year I wanted to spice it up a bit, so I tried a bunch of new things (some new to me, some new to Summerfest) and also some old favorites. Here's where I'll share my results! 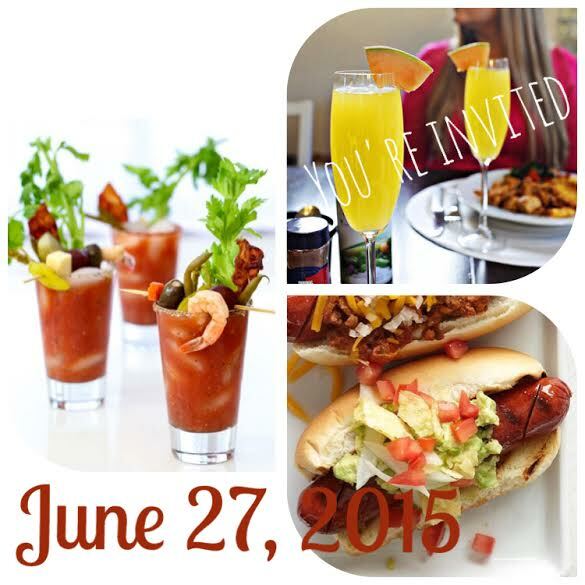 You still have four more days to go out and try it all! Enjoy it now, because soon we'll be saying "365 more days til Summerfest" again. They're crisped to perfection and sprinkled with just the right amount of seasoning. Not to mention the sour cream they put in there is so much better than regular sour cream. Kayla and I didn't buy anything else besides chive fries and beer that night (enough Blue Moons and Summer Shandys to make me go broke), and returned the next night to do a complete repeat of the night before. Summerfest Day 3 was a little bit different for me. Since my mom and I were trying to use up all our tickets, we went yesterday afternoon around 1:30, thinking it would be pretty dead. WRONG. It was Kid's Day, greaaaaat. On top of that, I handed the guy my ticket at the gate and he was like, "uh, you can go right in, it's free til 3." Having all these tickets to blow is a blessing but a curse. Anyway, there were about 10,000 children running around Summerfest grounds and a parade of giant characters on stilts that seemed to follow us to each restaurant we stopped at. But we persevered. Now, how could you see an advertisement for this and NOT stop at it? The curiosity was just too much to handle. 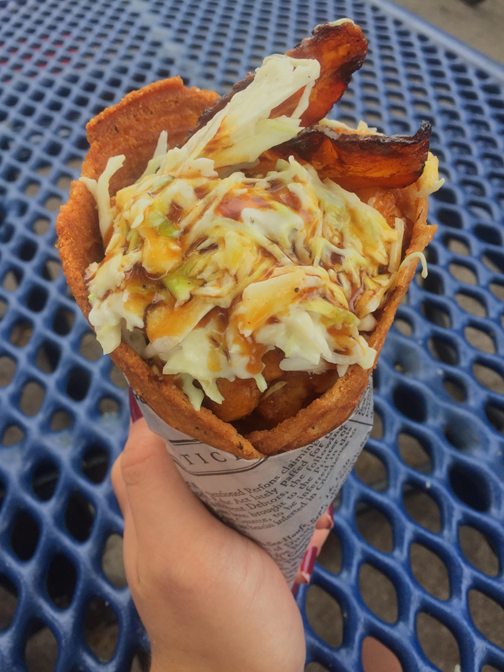 We decided we had to try the Chicken and Waffle Cone from Trinity. I've been to the real Trinity a few times and honestly didn't even know food was something they served. But this was good! 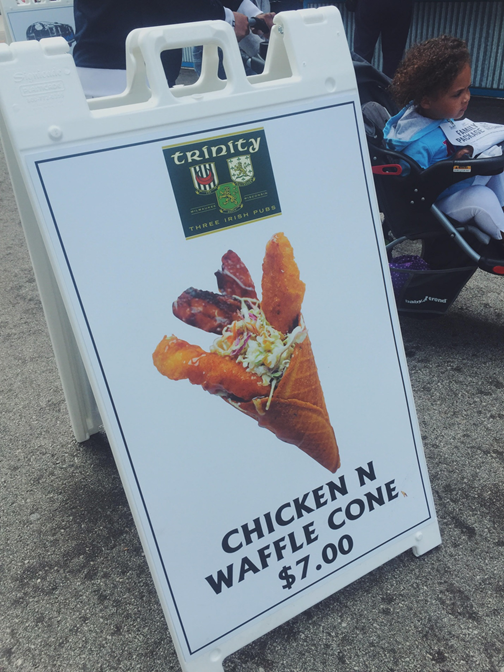 I've also never had anything chicken and waffle flavored before, so it was a unicorn of an experience for me. I'm not even a huge fan of fried chicken, but theirs was super tender and had really good Cajun flavor! There was just enough bacon for what it was, and only a little extra maple-dressed slaw at the end. Put all that goodness inside of what I think was a maple flavored cone, and you have a pretty weird snack. Good though! Whoever threw this one together did a pretty good job. Forgive me for the chipped nails. 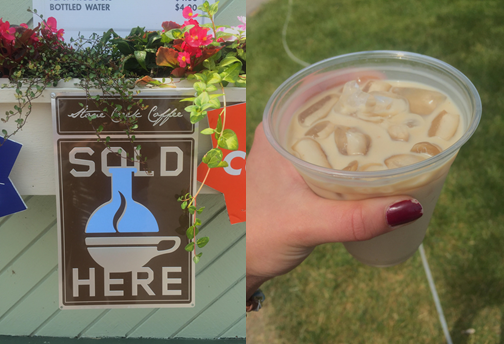 I try iced chai lattes everywhere, and have never had Stone Creek Coffee's. There isn't much to say about this one, but it was not the best iced chai tea latte that I've ever had. I prefer spicier. And I didn't get a cover or a human sized straw with it, so I had to dodge a lot of children making sure I didn't spill all over myself. I'd be willing to try it again at the real Stone Creek Coffee shop though, because you never know! We were hoping that Charcoal Grill would have stuffed mushrooms that my mom remembered having years ago, but they kinda let us down. We found some fried ones at Mille's and figured that would do. And they were also delicious! Pretty typical for fried mushrooms, of which I am a huge fan, but these ones had a loooovely sprinkling of Parmesan cheese on top which added nice flavor to a beloved snack. 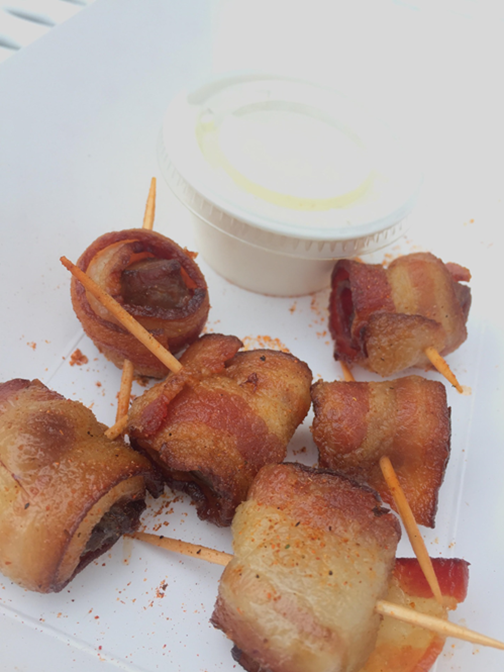 Moving right along, we stopped at Ward's House of Prime (new to Summerfest this year) and sampled the prime rib wrapped in bacon. It was a little expensive for what it was, I think $7 for 6, but delicious nonetheless. You couldn't really taste the prime rib over the bacon flavor though. Still, who doesn't like the flavor of bacon?! 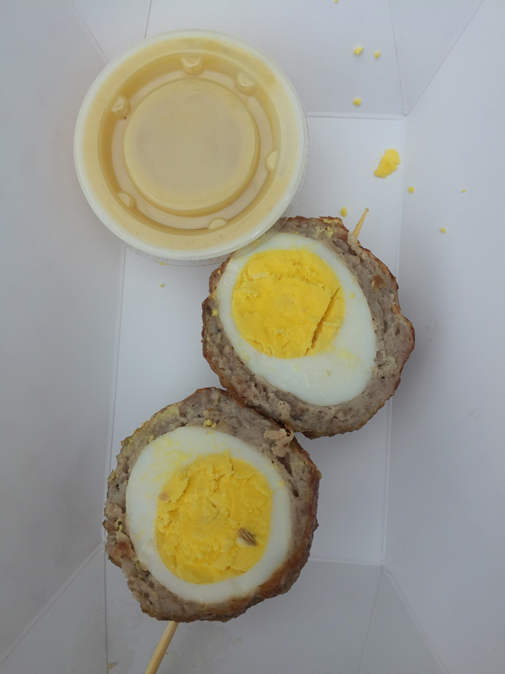 At the same stop, we got the Scotch Eggs. I really had no idea what to expect when I ordered it, so I was just willing to accept whatever they handed to me. 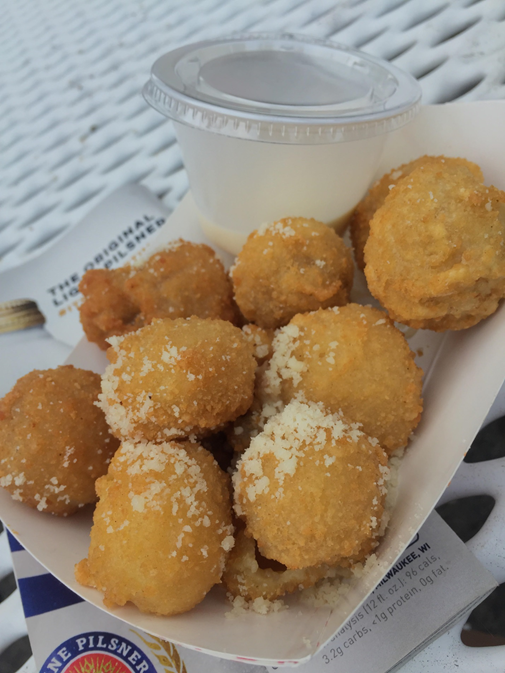 It was $4, so pretty cheap for a Summerfest food item. We each tried a half and determined that it must be a hard boiled egg wrapped in sausage and then deep fried. Looks crazier than it actually is. I would eat it again! This next one my mom wasn't a huge fan of, but it was one of my favorites of the day. Give me pizza or give me mac and cheese and I will be a happy girl. Give me both of those things in a cone shape and I will not be able to contain my excitement. This was just awesome. 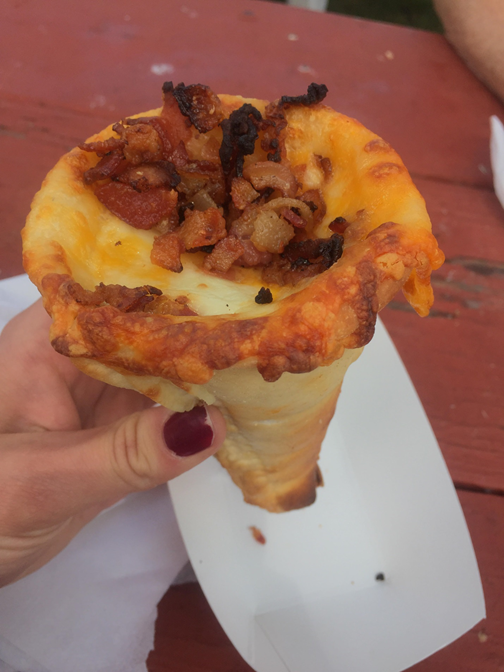 A cone filled with cheese, noodles, and bacon with crusted cheese and MORE bacon on top. I was pleasantly surprised that the whole thing was filled with cheesy goodness all the way to the tip of the cone. Not an easy thing to split in half though, I spilled a majority of the bacon onto the picnic table, whoops. We finished off our day at Summerfest with dessert. 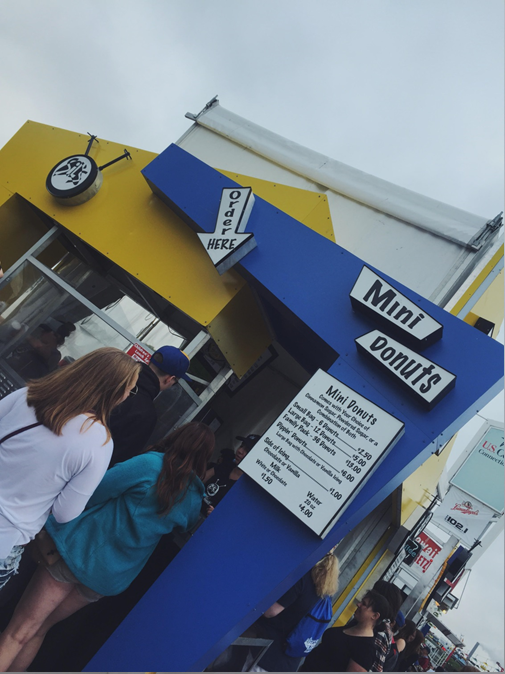 For as many times as I've walked by the Sil's mini donuts stand, you'd think I would have tried them by now. Nope! 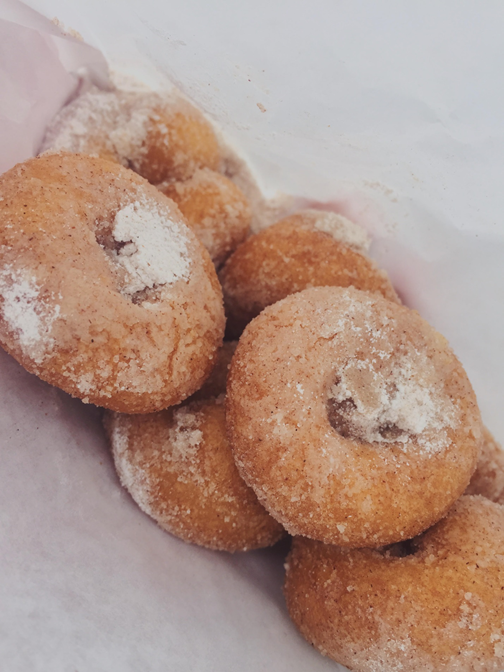 Nothing's better than donuts made right in front of you. We ordered a combo of both the powdered sugar and cinnamon sugar donuts...What we got was...Not that. They were so mixed up that I didn't really know which was supposed to be which. That didn't stop them from being delicious! 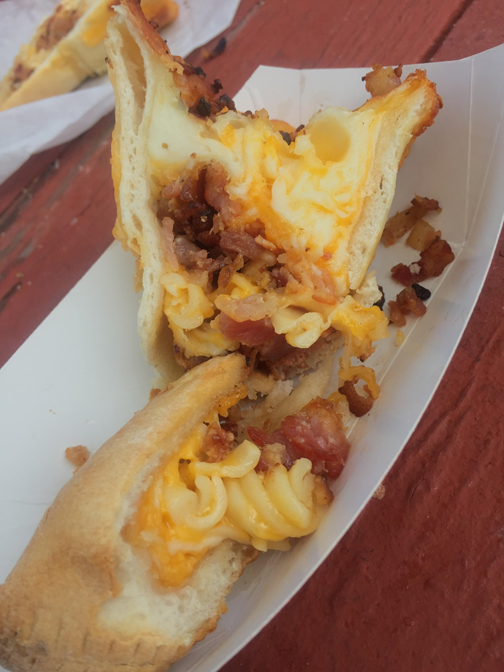 Overall, so far I've tried some pretty great food at Summerfest this year. I'm going back tomorrow, but it will be after dinner so I probably won't be hungry. I haven't got banana split Dip N' Dots yet this year though, so I can't make any promises. 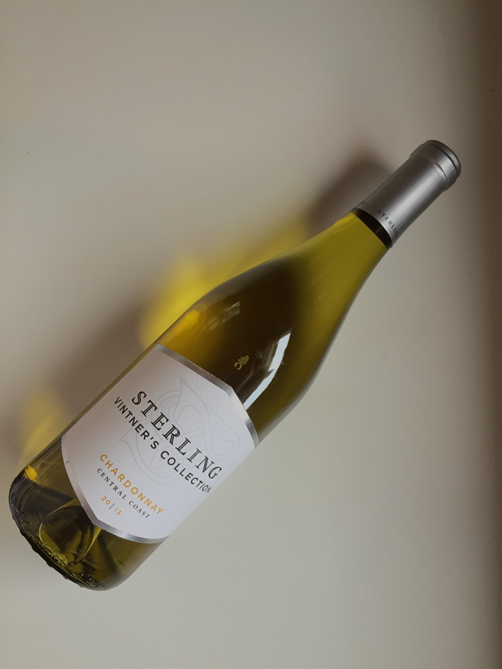 If I do happen to try something new and interesting, I'll be sure to keep you updated!